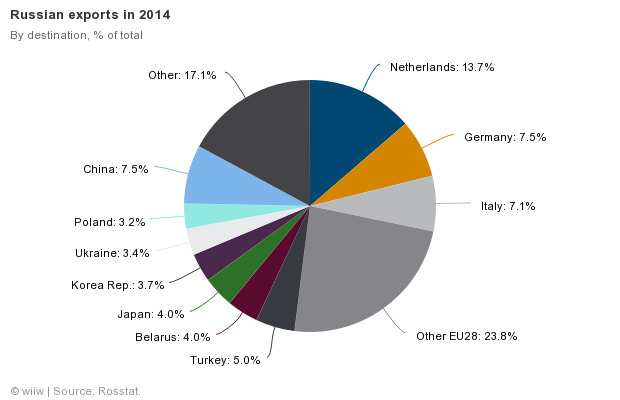 Trade reorientation in Russia: will China replace the EU? 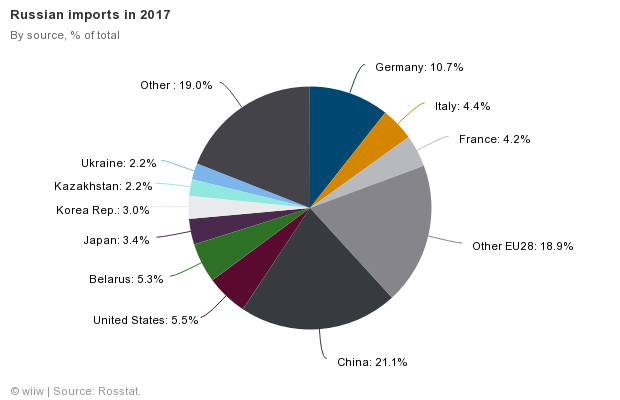 Ongoing tensions with the West mean that China’s importance as a source of imports for Russia will only continue to grow. 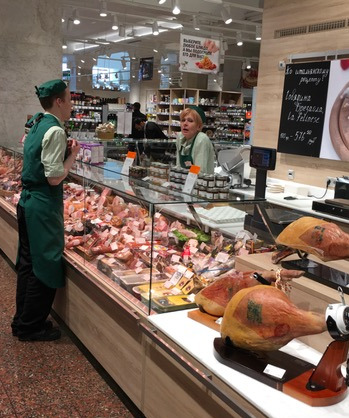 Russia has been successful in substituting Western food with domestic agri-food production after the imposition of import embargo in August 2014. At the same time, a reorientation of trade more generally away from the West and towards China has also been observed. However, some product groups, such as European cars, pharmaceuticals and machinery, cannot be fully and easily substituted by Chinese equivalents. In August 2014, in reaction to Western sanctions related to the conflict in Ukraine, Russia introduced bans on imports of agri-food products (meat, dairy, fruit, vegetables and fish) from the USA, the EU, Canada, Australia, Norway, Albania, Montenegro, Iceland and Ukraine. Initially, the import ban was imposed for one year, but has been subsequently regularly prolonged (as have the corresponding Western sanctions). According to the European Commission, the banned agri-food products amounted to more than EUR 5bn of EU exports to Russia in 2013 (5.5% of total EU exports to Russia at that time). The EU countries most affected by this ban were Lithuania, Poland and Germany (for a fully study on the impact see here). Despite some reported cheating and re-exports of banned EU food products via third countries such as Belarus and Serbia, the Russian import ban was relatively effective. It not only helped to boost Russian domestic agri-food production, but also to reduce the share of imported food in retail trade sales. Agricultural production increased by nearly 10% between 2014 and 2017 (as compared with a slight GDP decline over the same period). The share of imported foodstuffs in retail sales of food dropped from 36% in 2014 to less than 25% in 2017 according to Rosstat. The substitution of imports by domestic food production is thus well documented, and can be seen as one of the rare successes of recent Russian economic policies. Beyond food, a similar drop in import shares occurred in retail sales of consumer goods (from 44% in 2013 to 35% in 2017). Russian import substitution more generally, with a simultaneous reduction of overall imports, has been accompanied by the geographical reorientation of trade away from the West (in particular the EU) to the East (in particular China). The pivot to China became obvious in the aftermath of the Ukraine crisis, when the long-anticipated Sino-Russian gas deal was signed in May 2014 during Russian President Vladimir Putin’s visit to Beijing. 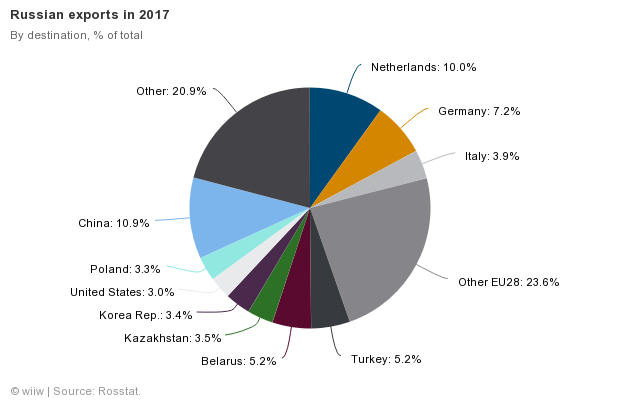 The share of the EU28 in Russian exports dropped from 52% in 2014 to 45% in 2017, and the corresponding shares in Russian imports fell from 41% to 38%. Over the same period, the share of China in Russian exports increased from 7.5% to 12%, and from 11.5% to 21% in Russian imports. Currently, Russian imports from China (EUR 48bn in 2017) are about half as large as imports from the EU28 (EUR 87bn in 2017), yet they are twice as high as Russian imports from Germany (EUR 24bn – see Figure 1) and rapidly increasing. Trade reorientation away from the West towards China is thus speedily progressing. However, what matters is not the level of trade volumes, but also the evolution of trade structures, in particular with regard to imports. Whereas in Russian exports mineral fuels prevail in both directions (more than 60% of total Russian exports--76% of exports to the EU and 64% of exports to China—are fuels), there are important differences in the structure of Russian imports from the EU and China. This reflects the fact that, in certain areas, Russia still needs products and equipment that it can only obtain from Western sources. 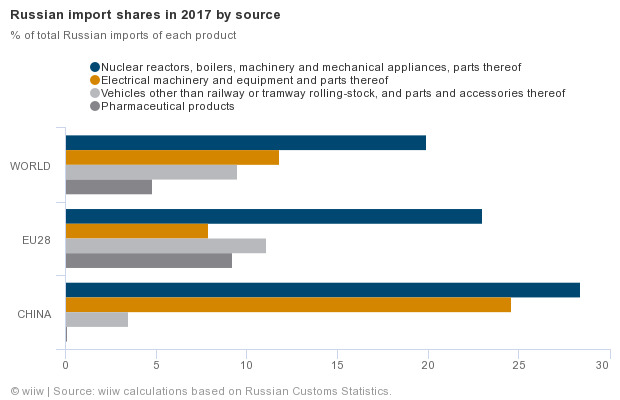 For example, whereas the HS84 category (nuclear reactors, boilers, machinery and mechanical equipment) represents the largest import item from both the EU and China (with shares in total Russian imports of 23% and even 28% in 2017, respectively), the second and third most important categories of imports from the EU: HS87 (vehicles, 11% of Russian imports) and HS30 (pharmaceuticals, 9%) are still largely absent in imports from China. Nevertheless, import structures are also converging: between 2014 and 2017 these structural ‘import gaps’ were substantially reduced – most spectacularly in the above mentioned three largest import items. The structure of Russian imports from China is also becoming more sophisticated: the shares of machinery and electrical equipment are already higher than the corresponding shares in imports from the EU (Figure 2). As the EU-China import gap closes for Russia, one can conclude that China is gradually replacing the EU as an import source, even with respect to structural developments (although there remain gaps at more detailed commodity levels). 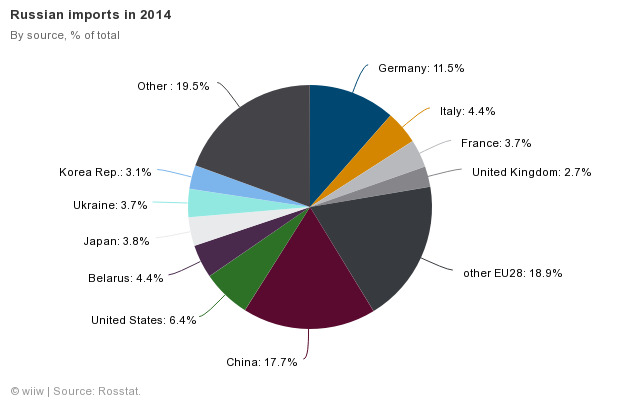 China is thus gaining in importance as Russia’s leading trade partner, largely at the expense of the EU. It is likely that together with a growing Chinese economy and the lasting conflict with the West, Russian external trade relations will reorient further to the East and Sino-Russian economic relations will become closer. The Chinese ‘One Road One Belt’ initiative, as well as the Russian-dominated Eurasian Economic Union, will reinforce and underpin this tendency, despite widening asymmetry in Sino-Russian relations as the Russian economy will fall further behind. 1 More details in: ‘Продовольственное эмбарго: импортозамещение и изменение структуры внешней торговли’. Бюллетень о развитии. No. 11/2015, August, Analytical Centre by the Government of the Russian Federation, Moscow. 2 With respect to Ukraine, the import ban has been partially applied since September 2014 and fully since January 2016, after the trilateral Russia-Ukraine-EC negotiations failed. 3 Part of this drop can be explained by the combined effect of a depreciation of Rouble exchange rate and the collapse of oil prices that resulted in a drop of Russian imports by more than 40% between 2013 and 2016 (imports partly recovered in 2017, by 24%).